The Dead Sea Scrolls contain manuscripts of at least part of every book of the Old Testament except the book of Esther. 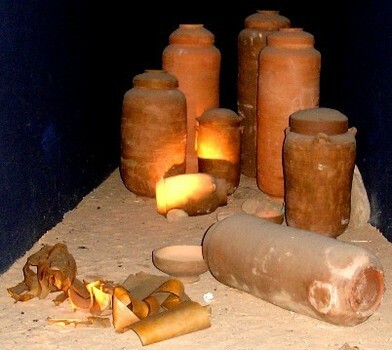 The stone jars with the ancient scrolls were found in 1947 at Qumran near the Dead Sea and they have provided an invaluable source of evidence for the basic accuracy of the Bible text as we have it today. Before they were discovered the oldest complete Hebrew manuscript of the Old Testament was the Leningrad Codex (1008 AD), known as the Masoretic text. The Dead Sea Scrolls are dated to between 250BC and 68AD, that is, at least 1000 years older and so that much closer to the production of the original text. However, the most exciting aspect of the scrolls is how they demonstrate the accuracy with which the Hebrew text was maintained over a period of well in excess of 1000 years. A common charge leveled against the Bible is that the text is riddled with mistakes and amendments made by scribes over the centuries, so how can we possibly be confident that the text we have today is still faithful to the original? Comparison of the 10th century Masoretic text with the Dead Seas Scroll texts from 1000 years earlier show a remarkable consistency. The texts from Qumran prove to be word-for-word identical to our standard Hebrew Bible in more than 95 percent of the text. The 5 percent of variation consists primarily of obvious slips of the pen and spelling alterations which have no affect on the meaning1. 1) Archer, Gleason, Jr. (1974), A Survey of Old Testament Introduction (Chicago, IL: Moody).